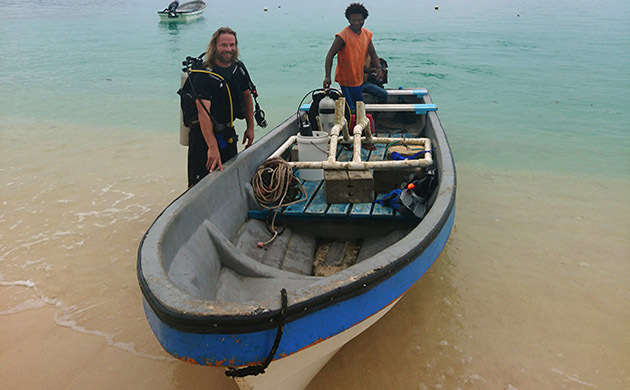 Matt Enright (left), a marine science advisor with Volunteer Services Abroad (VSA) program, and his mentee Warren Pingo prepare a research vessel for fieldwork at the Nago Island Research Facility in Papua New Guinea. Enright is on a 12-month contract with VSA to organize and implement a long-term ocean acidification time-series monitoring program in the region—a project supported with an equipment grant from The Ocean Foundation. A large component of Enright’s job is to provide Pingo with the technical training required to service and deploy oceanographic research instruments and upload the data to an international database for ocean acidification observations. After completing his master’s degree in chemical and physical oceanography at Otago University in New Zealand in 2006, Kiwi native Matt Enright embarked on a dream life for many early career scientists. As a research specialist for the Bermuda Atlantic Time-series Study (BATS)—the world’s longest-running time-series of physical and biogeochemical oceanographic measurements—Enright spent much of his time at sea aboard the BIOS-operated research vessel Atlantic Explorer. During these days and weeks on the water, Enright was fortunate to work with a constant stream of visiting scientists, each representing a new opportunity to learn and network. For five years, until 2017, Enright worked alongside Rod Johnson, an assistant research scientist at BIOS and co-principal investigator of the BATS program, to improve the efficiency of data collection and sample processing methods. Having worked his way up from an entry-level research technician role to that of a research specialist, Enright began to look for opportunities to advance his career in ocean science. “Rod’s dedication and organization showed me what was required to develop a great science program and I was keen to see if I could apply the skills and lessons I’d learned in a new environment,” Enright said. The Nago Island Research Facility, located in the New Guinea Islands region of Papua New Guinea, is quite small compared with many modern oceanographic research stations. Approximately 20 individuals live and work at the station with research activities primarily focused on the cultivation of local fish and sea cucumbers for food. 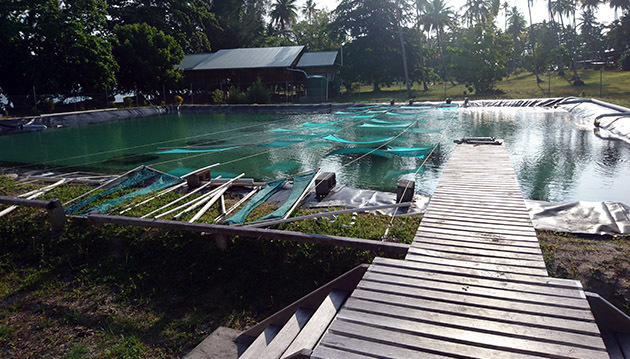 Pictured are some of the sea cucumber mariculture facilities. Enright hopes that his work will provide the foundation for a long-term research project that will position the facility to obtain additional funding through various United Nations sustainability programs. Photo courtesy Matt Enright. An internet search led him to the Volunteer Services Abroad (VSA) program, which pairs New Zealanders with volunteer opportunities throughout the Pacific with the goal of transferring skills and knowledge to help develop sustainable, self-determined communities in developing countries. After entering his ocean science skills and experience into the online search form, Enright landed upon a unique opportunity to set up an ocean acidification monitoring program at the Nago (pronounced Nahn-go) Island Marine Research Facility in Papua New Guinea, a country north of Australia. After five years of living on a small island in the middle of the Atlantic Ocean (Bermuda measures 22 miles, or 35 kilometers, long by roughly 1 mile, or 1.6 kilometers, across), Enright said farewell to his BIOS colleagues and traveled 9,866 miles (15,878 kilometers) around the world to an even smaller island in the southwestern Pacific Ocean. Nago Island, a 10-minute boat ride from Kavieng, the provincial capital of New Ireland, in the New Guinea Islands Region of Papua New Guinea, makes Bermuda look large by comparison, measuring 0.6 miles (1 kilometer) long, about the length of ten soccer fields, and 0.3 miles (500 meters) across, about the length of five soccer fields. While Bermuda houses a population of 60,000 and offers a variety of hotels, restaurants, and recreational activities, Nago Island comprises a local village of about 70 people, in addition to about 20 colleagues at the research station. With an equipment grant from The Ocean Foundation, a U.S.-based not-for-profit organization, Enright is setting up an ocean acidification time-series monitoring program with instruments and techniques similar to those he used with BATS. His primary role involves instructing staff how to use computers, work with oceanographic research instruments, and upload data to the Global Ocean Acidification Network—an internationally coordinated effort to improve ocean acidification observations at local and global scales in order to better inform ocean policy. Enright describes his work as “capacity building” within ocean sciences, an umbrella term used by the United Nations and other intergovernmental organizations that includes activities like developing basic science infrastructure (such as labs and research programs), building human skills through technology and computer-based training, and bringing new technologies to developing countries. One such example is Enright’s mentee at Papua New Guinea’s National Fisheries College, Warren Pingo. Until very recently, the 30-year-old high school graduate worked as a carpenter because he could not find work in the ocean sciences. Pingo’s history illustrates the challenges that many locals face in their attempts to obtain a formal education and translate that into a professional career. Pingo walks 30 to 40 minutes each day to catch a boat to Nago Island, another 10 minutes away. His home, which he shares with his wife and child, lacks electricity and consists of a wooden frame with woven walls. Like many in Papua New Guiana, Pingo has missed work because he or a family member has contracted malaria. However, he is still considered one of the lucky ones: he was able to finish high school, whereas lack of funding, illness, and political upheaval prevents many from doing so. Under Enright’s guidance, Pingo is learning a wide range of skills, such as using a cell phone and sending email, as well as those critical for his future success in ocean sciences, including deploying and recovering instruments and working with data. The goal, says Enright, is to train Pingo to take over the program once his contract with VSA is up at the end of the year. Enright has expressed interest in extending his contract with VSA for another year and using some of his own funding to hire more people from the local university, such as a chemistry student to analyze the water samples. In either case, once he leaves, Pingo will have the technical expertise to run the lab, with the goal of modeling research after a long-term time-series program like BATS. Working in Pingo’s favor is the fact that Papua New Guinea is considered a small island developing state under United Nations (U.N.) criteria. This improves the likelihood that organizations like the Nago Island Marine Research Facility will receive funding for equipment and training for ocean acidification monitoring, which has been declared a U.N. sustainability goal. Funding also trickles in from other organizations, such as The Ocean Foundation. In addition to an initial grant that funded basic equipment—what The Ocean Foundation calls “GOA-On in a box”—the foundation also provides an annual stipend for Pingo and recently funded his trip to Hawaii to attend an advanced training course in ocean acidification instrumentation. Even with this support, however, Enright expresses concern about the ability of the program on Nago Island to become self-sustaining in the long-term. 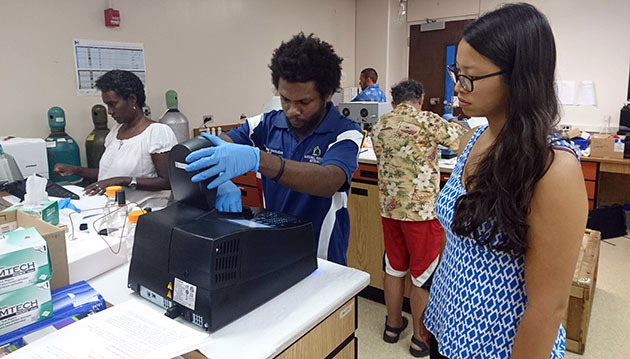 Warren learns how to measure the pH of a sea water sample using a spectrophotometer at the Pacific Advanced Ocean Acidification Monitoring Training course, held in Chris Sabine’s Lab at the University of Hawaii Manoa in Honolulu, Hawaii. Photo courtesy Matt Enright. Regular blackouts, slow or nonexistent internet, shortage of supplies locally, difficulties working with overseas suppliers who are reluctant to overlook the country’s reputation for nonpayment, and government decisions that negatively impact the availability of funding—all of these are challenges that need to be overcome if the program is to succeed. While the future is uncertain, Enright remains hopeful.